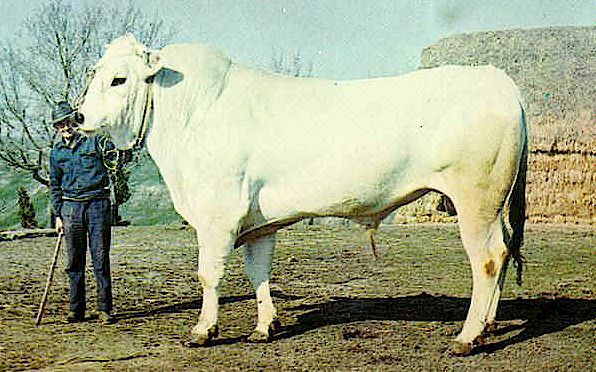 The white Chianina ox, only fifty years ago a fixture of every Tuscan landscape, is the largest extant breed of cattle in the world. 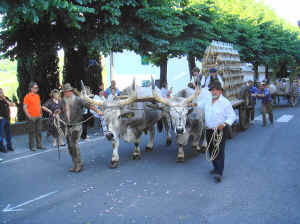 Large cattle were known in Lucania during Roman times and the Chianina cattle of the Val di Chiana may well trace back to these. The oxen now known as the Chianina were praised by the Georgic poets, Columella and Virgil, and were the models for Roman sculptures. The breed originated primarily in the west central part of Italy and was found in a wide variety of environmental conditions. 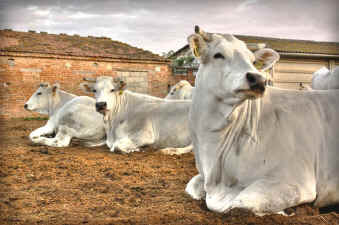 Because of this, Chianina cattle vary in size and type from region to region. 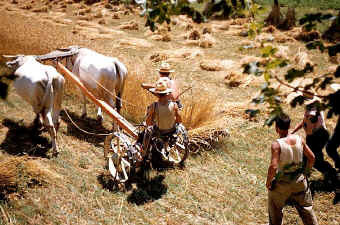 The largest representatives are from the plains of Arezzo and Sienna - the Val di Chiana of Tuscany. 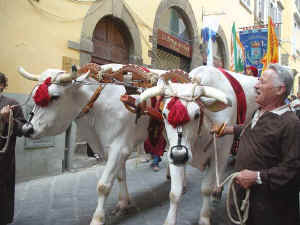 Until recent times the Chianina ox was used in Tuscany primarily as a draft animal. With the advent of modern mechanised farming practices, the selection emphasis has been placed on the breed's ability to produce beef. The earlier selection for work animals had produced a very large animal with considerable length of leg, good action and heavy muscling. A docile disposition was also desired in the draft animals. The later selections for beef production has maintained the size of the breed and improved the rate of growth. The famous Florentine T-bone steak, the bistecca alla Fiorentina, is by tradition prepared from Chianina beef although there is no law mandating this and vast amounts of Spanish and even Argentinian beef is sold in Tuscan butchers and especially restaurants as bistecca alla Fiorentina. 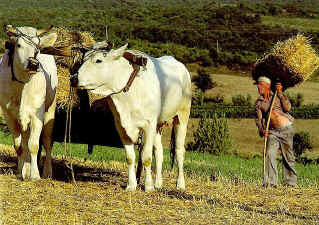 As little as fifty years ago, white Chianina oxen - buoi or bovi, in Italian - in use as beasts of burden, usually pulling ploughs, were a common sight in Tuscany. They have been replaced completely by caterpillar tractors. Val di Chiana © ammonet InfoTech 2008 - 2016. All rights reserved.